Andrew Jackson was a fighter. He battled the British, his fellow lawyers, the Creek Indians, the British again, the Spanish, the Seminole Indians, John Quincy Adams, and the Washington establishment. In another in a series of revisionist biographies of early American leaders, H.W. Brands' Andrew Jackson: His Life and Times is short on revision but long on sycophantic acceptance of the theory that Jackson single-handedly reshaped the republic into a democracy by being a man of the people. David McCullough's John Adams and Ron Chernow's Alexander Hamilton set the standard for compelling American biographies that transformed the dust covered, moribund history writing that plagued the industry. Brands's research and writing are superb. He tells Jackson's story in the third person but from Jackson's own point of view, which leads the reader to empathize with the orphaned teen ager who reads law and makes his way west to find his fortune. 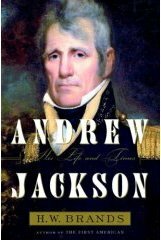 The story of Andrew Jackson is essentially narrated in two parts, from birth to the transfer of Florida to the US and from the 1824 election to Jackson's death. The first half of Brands' chronicle excels. He captures the heroicism of Jackson's meteoric rise from frontier lawyer to victor at New Orleans. Witnessing Jackson's victories over the marauding Red Sticks or Wellington's crack troops through Brands' eyes is like being there, adrenaline pumping, patriotism suffusing your entire being. The characteristics that led Jackson to unbridled military success, though—his fiery temper, his brash temerity, his kindly paternalism, his single-minded dedication to national security, his willingness to ignore the rules—were his weaknesses as president. Jackson the warrior, sworn to protect the Constitution, was not above ignoring it in order to save it. In both New Orleans and Florida, Jackson willingly put aside the Constitution for the sake of security. In the Crescent City, after the defeating the British, Jackson refuses to lift the martial law he had imposed, and when questioned on constitutional grounds by a Federal judge, he escorts the man out of the city for "abetting mutiny." Jackson excursion into Spanish Florida during the First Seminole War, without the permission of President Monroe, was an act of war and certainly unconstitutional. Brands dismisses the concern, stating that Jackson's myopic vision where the Constitution was concerned was rooted in national security concerns. The premise that Jackson's election in 1828 led to the transformation of the US from an aristocratic republic to a democracy of the people. As often as Brands beat the drum of Jacksonian democracy, he never makes a convincing argument that Jackson actively initiated the conversion. Instead one is left with the impression Jackson was the focal point of more direct democratic participation by a larger percentage of white men, driven namely by the nastiness of Jackson's 1824 defeat by John Quincy Adams and Old Hickory's popularity as a war hero, but Jackson did little to affect the change. Brands gives short shrift to either contemporary or modern criticism of Andrew Jackson. As President, Jackson signed the Indian removal Act and refused to enforce the Supreme Court's decision in Worcester v. Georgia, which led to the removal of the Native American Indians west beyond the Mississippi ending in the Trail of Tears. Brands dedicates precious few pages to Jackson's treatment of the Indians, acknowledging the disaster but exonerating Jackson of all culpability with arguments about national security and Jackson's paternalism toward the Indians. Ultimately, one must ask: What is Jackson's legacy? At best, it's a mixed bag. He deserves shared credit for the acquisition of both Florida and Texas. His handling of the Nullification Crisis held the Union together for another twenty-eight years. At the same time, Jackson legacy includes the spoils system, economic recession after his battle with the Bank of the United States, and the Trail of Tears. H. W. Brands missed an opportunity to set the Jackson record straight, instead opting to accept the same old historiography encouraged by Jackson himself.